Two posts in one day - crazy! Here's a link to my Dudek Modern Goods review from earlier today in case you missed it. After talking with Mike off and on for a couple of months on the custom-designed penholders, I felt that I had a pretty good impression of him. I've also been following MrMikeDudek on Instagram nearly forever and getting a glimpse into the kinds of things that are important to him. My final (ha! ), "Hey, Mr. Mike . . . I have an idea," message to him was a request for him to answer some questions that I could publish here - an interview of sorts. True to form, his response was, "Let's do it!" Do you remember when/how you became interested in pens and pencils? It probably really developed after high school when I started noticing that I found myself only using certain types of pens (office supply store stuff). For awhile it was the Pilot G2, then the PaperMate Flair (still a love of mine), then the Pentel Energel. Honestly, I didn't really know early on that "fancy" pens existed! Once I found out about this new world, I've obviously been hooked and now enjoy all sorts of fountain pens, rollerballs, ballpoints. Which came first - the blog or the shop? Definitely the shop. Prior to The Clicky Post and Dudek Modern Goods as it exists now, I was always a tinkerer of sorts and enjoyed building/creating things. I suppose I have a short attention span to things at times... once I learn of something cool that someone could make I often push myself to acquiring the tools and skills to make it happen. One example of this are some coin rings I crafted for a time which was really fun. I'd seen other people selling them or had seen pictures and thought, "I can do that". It seemed like I quickly had the tools to do so and started making and even selling them. As you can imagine, this "flighty" behavior with regard to hobbies can become expensive after awhile, so I usually try to learn to make something and sell enough of them to simply cover the costs of acquiring the tools and materials. Not necessarily as a "business idea" so-to-speak, but to keep spending and time in check. 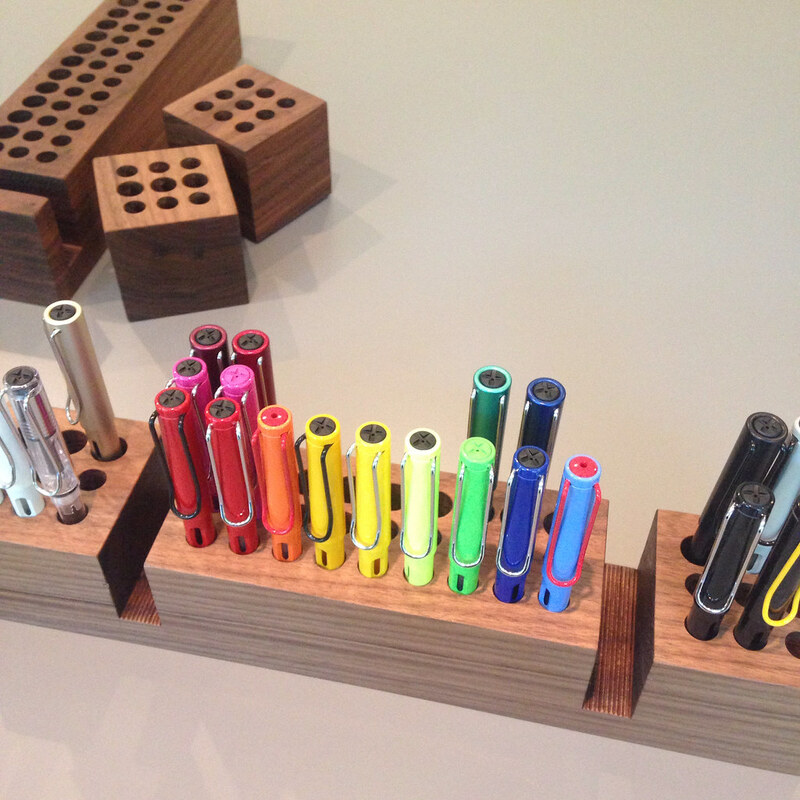 Dudek Modern Goods and my pen holders probably started out a bit like this as well, but has grown into much more for which I am extremely grateful and humbled! What do you have in mind for the future of Dudek Modern Goods? This is something I have mulled over in my mind many times. For the moment it keeps me busy with several sales per week (less than a full fledged business, but more than a hobby), but it is something I'd like to expand and grow. The only problem with this is manufacturing and time considering each piece is handmade by me personally. I have a full time job and small family which keeps me very busy, so squeezing more time out of my days and weeks is unlikely from a growth perspective as things are now. To expand the line and potentially move into select retailers would require a somewhat uncomfortable word called outsourcing or outside manufacturing. Perhaps this is something I personally need to get over as the product designs are sound and they are still mine, but to get them into the hands of more people would require some help. I want to expand, but at the same time don't want to feel like I am diluting the experience of the true "handmade". Deep thoughts.... I'm sure eventually it will sort itself out and I'll partner with an awesome local company to help with my production, but rest assured that my hands will still be in the mix. What are your other interests? Tell us about your family, your work - something, anything! Outside of The Clicky Post and Dudek Modern Goods, I enjoy spending time playing with my two small kids (ages 2 and 7 months) and trying to find quality time with my wife whom has been so supportive of everything. I'm kind of a geek at heart and enjoy learning about all sorts of random things like history (particularly WWII), the development of technologies from the past, architecture, or ancient cultures. I don't have much time to watch TV or movies, but when I do it is usually some sort of documentary... haha. Like I said, GEEK. I work for a software business here in Arizona that helps small businesses with marketing automation. I'm not one of the programmers for the company, but act as a small business consultant and strategist to help provide direction for these small entrepreneurs. I LOVE small business and am genuinely excited to work where and with whom I do. No matter what the business: window washing, organic oatmeal and soap production, or business coaching, I find enjoyment in hearing about people's passions in their work. Doing what I do has actually fueled a fire in me to have more entrepreneurial pursuits like Dudek Modern Goods in my own life. I feel that everyone should find something they love and take a leap of faith to present it to the world in some consumable way. What is your favorite (clean) joke? Thank you for everything, Mr. Mike! Here's where you can find Mike . . . I'll be back on Wednesday with a look a Toucan Fountain Pen Ink from Australia - it comes in bags instead of bottles!